Not every problem with Android should be called "fragmentation"
Every single time we post an article about the next Android OS update, there is the inevitable calls about "fragmentation", and how Google should fix its "fragmentation" problem, which people claim is exacerbated simply by Google updating its platform. The trouble is that every problem with the Android platform is automatically attributed to "fragmentation", but this is a dangerous practice. Calling every issue "fragmentation" automatically shifts the blame to Google, because it insinuates that the issue is based in the Android system itself, when this is certainly not the case. The biggest problems with the Android platform are not the fault of the system itself, but rather the developers in the ecosystem and the manufacturers of the devices. We've said as much before, specifically saying that the Android platform isn't fragmented, but it is inconsistent at worst and unique at best. The trouble is that people see any update as a furthering of some sort of "fragmentation" problem. But, here's the truth: every software platform in the world has multiple software versions and various hardware setups in the wild, and that includes Apple's iOS. We can't define "fragmentation" because it's definition has already been written by the most biased source possible: Apple. Apple would like us all to believe that somehow the device and software variation on Android is somehow a problem, when every platform has those same issues. More and more, the devices in our pockets are nothing more than extremely intricate computers, and no matter what, there will be variations in hardware and software on any computer system. Those variations can cause problems with specific hardware configurations, but overall everything works across versions. That's why your Windows XP machine at work can run the same software as your Windows 7 machine at home, or your OS X Mountain Lion can run the same apps as your cousin's OS X Leopard machine. Android, iOS and other mobile platforms are no different, except in Apple's definition, which makes Android somehow the odd one out. As we've said before, "fragmentation" is nothing more than a negative marketing buzzword coined by Apple to attack the up-and-coming Android platform that was threatening to (and eventually did) take Apple's mobile market share. There are two things that people often point to when claiming that Android is "fragmented": 1) multiple software versions and 2) various hardware setups. As we said, that doesn't make a platform "fragmented", because if it did, then every platform in the world is "fragmented". If those are the criteria for fragmentation, then Apple's iOS is just as guilty as any other platform. There isn't one singular iOS device. In fact, there are now 3 different iPads, 4 different versions of iPod Touch, 5 different iPhones, and 3 versions of Apple TV, which run a modified version of iOS. For clarity, we'll just be counting the mobile devices, which means 12 total variants of iPad, iPhone and iPod Touch. This means the iOS ecosystem is filled with multiple screen resolutions, screen sizes and internal hardware. And, the ecosystem is also filled with multiple software versions. If Android 1.5 and 1.6 still account for about 1% of the Android devices in the wild, it seems reasonable to assume that there are still original gen iPhones and iPod Touches out there, which aren't compatible with iOS 4 or higher. It's also safe to assume that there are iPhone 3G and 2nd gen iPod Touches in the wild, and those have limited compatibility with iOS 4 and are not compatible with iOS 5. This is something unique to iOS: you can get an update, but not all the features associated with that update. At least with Android, if you get the update, you get all the features as well. So, that means there are 4 of the 12 mobile iOS devices that are incompatible with the newest version of the operating system, which means only 66% of mobile Apple devices are even compatible with the newest OS. Sure, the same can be said about Android, but that's exactly the point: there will always be outdated devices in an ecosystem. Of course, it's also important to remember that having a device compatible with the newest update and having that update readily available doesn't mean that everyone has updated to the newest version of the software. Apple doesn't release statistics about how many users are running what version of iOS like Google does with Android, so it makes it harder to pin down the numbers. Chitika measures iOS update rates via browser traffic, but only for the first month or so after an update release, so even this doesn't help. Regardless, the point is that updating is voluntary, and as a general rule people tend to be a bit lazy about updating. This statement is obviously not directed towards the incredibly passionate and engaged users that we get reading and commenting on our site, but the general public, many of whom don't update software with that much regularity. Additionally, there are those who have jailbroken their devices and can't update until reliable untethered jailbreaks can be made for each new OS version and hardware variation. So, this means the iOS ecosystem is not the unified whole that people make it out to be. There are multiple hardware setups and various software versions, just like Android. However, Apple also does something that is rarely mentioned, which makes it so that the "fragmentation" of iOS is designed to benefit developers, not users. This doesn't mean that iOS is necessarily easier or has better tools for development. We mean that Apple splits the iPhone and the iPad into two categories, where Google doesn't. Apple, just like Google, has given developers the tools to make their apps work across the board on all devices, except that's not how it works in practice. Sure, all the apps made for the iPhone will work on an iPad, but it doesn't go the other way. This has lead to a phenomenon where there are often two versions of every app in the iTunes store: one for the iPad and one for the iPhone, because while iPhone apps will work on the iPad, they are lower resolution, and don't look good. Developers can make one single listing in the iTunes store for an app which will work on both iPhone and iPad, but often there will be two separate listings because the iTunes store does a good job of splitting browsing and search results into iPhone and iPad sections. The result of this, and the reason we say that Apple's way benefits developers as compared to Google's is because with developers often having two listings in iTunes, they charge you twice for the same app if you want it on both your iPhone and iPad. This isn't always the case, for example Infinity Blade is one price and one listing for both the iPhone and iPad, but many apps or games will cost you twice, like Dead Space, which is $7 for the iPhone version and another $10 if you want it for your iPad as well. On Android, there is one listing, and thus one price. If you want Dead Space, it costs $7, and that is good for your phone and tablet. That's a big benefit for users, although maybe not so much for developers. Google has always pushed towards having one listing in the Google Play Store. There was a brief period where developers would have two listings on Android: one for Gingerbread and lower, and one for Honeycomb. To avoid this, Google began allowing developers to have multiple installer files on each listing, which would automatically be delivered based on the user's version. And from here on, it isn't just the same OS that will be on Android tablets and phones, but the same apps will work on all devices as well. And, that leads us to the number one issue cited as a problem: developer support. Developers claim the platform is too troublesome because of device specific variations, but the reality is that it's just that developers don't think they make enough money to justify that work. This could be because of the single listing and therefore single purchase of apps, but it's really just a vicious cycle where developers don't put enough support into the ecosystem, and so the ecosystem doesn't support developers. This leads to the biggest cause of what some call fragmentation, but we would rather call inconsistency: developers don't make apps available to all devices. Google has done everything it can short of mandating compatibility, but developers keep apps tied to certain devices and certain OS versions. If you build an app using the API level for Gingerbread, it will work on all devices newer than Gingerbread, unless specifically excluded by the developer. The tools are there, so if there is anyone to be angry at about any fragmentation issues on Android, it is developers, because it isn't so much fragmentation as app incompatibility as dictated by the developers. Calling it "fragmentation" shifts the blame to Google, when it should really be with the developers. Just one last thing that deserved its own space before we wrap this up, since it was our opening salvo. Slow updates are not the same as fragmentation. Yes, there is a delay in Android updates because of the manufacturer and carrier layers of the update process, but let's not delude ourselves into thinking that this is the definition of fragmentation or even a part of it. As we made clear before, the availability of an update does not ensure an updated device. If it did, 100% of iPhone 3Gs, 4, 4S, iPad, iPad 2, and new iPad devices would be running iOS 5, and that simply isn't the case. Manufacturers and carriers slow down the Android update process considerably, but there would still be multiple Android versions in the wild even with an update model similar to Apple or Microsoft. And, that model also means no uniqueness from device to device. Like it or not, if it weren't for the custom UI layer on Android, the HTC One X, the Samsung Galaxy Nexus, and Sony Xperia S would all be the same device, just with minor variations in shape and CPU. Just remember, if you don't like that about Android, there's always Windows Phone and iOS. A feature of a platform is not an insult to you, it is a choice for everyone. All of that said, there is something of an issue with Android that may fall under the heading of fragmentation, which is the forks made by companies like Amazon with the Kindle Fire and Barnes & Noble with the Nook Color/Tablet. The trouble with tagging that as "Android fragmentation" is that many users may not even know those platforms are Android at all. But, that's a whole different topic that we'll cover in another column either tomorrow or Monday, so please don't yell at us in the comment thread here about that issue. We'll cover it. Promise. I agree that there's some fragmentation on every platform. It is however much much worse on android. For example ios 5 came out in October and was imediately available for all supported iPhones. Ice cream sandwich has been out for months and is only available to a handful of devices. Im typing this on the Galaxy Tab 7.7. Brand new device and yet it's running 3.2. Also on my ios devices apps are compatible immediately. I downloaded hulu plus to the galaxy tab and it says my device is not supported. Android definetly is a LOT more fragmented tan other platforms. I updated the article to respond to this. I didn't make it clear enough the first time around. I don't like the idea of calling app incompatibility "fragmentation" because that insinuates that the fault with the incompatibility lies with Google or the Android platform, which isn't the case. Hulu Plus isn't available on your Galaxy Tab or my Galaxy Nexus because of restrictions placed by the developer, not by faults in the Android system. There is nothing stopping that app from running except the will of the developer. That is a problem, but it isn't "fragmentation". It's developers building apps with limitations. Why do I not have that issue on iOS? The reason can vary, but the user experience is better on iOS. Aha, but that's not the argument. I would never claim that Android has a more seamless user experience than iOS, and I hope I haven't unintentionally insinuated that here. The Android system alone doesn't cause these problems, so it is simply unfair to claim them as "fragmentation" problems. They are problems, but not ones that we need to target Google to fix. Every problem with the Android platform (of which there are quite a few) can't all be thrown under the blanket of "fragmentation". There are problems with slow updates, but that isn't a fragmentation issue, it's a delay caused by manufacturers and carriers. There are problems with app compatibility, but that isn't fragmentation either, it's a problem with developers. Your response has confused him, sorry to say but it happens ALOT when fan boys on both sides argue. I think this is about the clearest explanation there can be about the issues. Our systems are based on factors that are often out of control. With Apple, the benefit for them is that they control every aspect of their ecosystem. Thus, it is easier for them to update or release something and have it supported across many devices. However, manufacturers with their embelishments cause slow updates to their devices because they want to be different. Carriers cause slow updates because it must be optimized for their network. Google, as they are, are does not control everything and that hurts their situation. Either way, Android is a great OS but it needs all the players in it to just stop messing with it. I see your point; however, if Google was to strongly take Android in hand and control it completely, like Apple does with iOS, they would no longer be providing an open-source ecosystem. Android would become just another walled-garden OS, and would no longer be as advertised. The day that Google turns to total control will be the day that Android becomes another iOS or BlackBerry. Now, some may argue that no one really cares to have open-source any more (I hear that arguement a lot from people I know well), because no one who isn't a total nerdy/geeky techie truly bothers to develop or tweak any more... as one friend put it, "... the real tech-savvy people go to the iPhone because we are cool and have class, and because we can show our tech-savvy by choosing the best of the best, while the hopeless nerds will still cling to their custom Android garbage...", but I believe there are still folks out there who seek to be free to change things to suit them. If I was a triangular peg, and some kid tried to squeeze me through the square hole, I would be fairly upset... it is true that iOS may be a good fit for a lot of people, but it can't be the best fit for everyone on earth. The nice thing about Android is that it can still be edited to suit a wider array of tastes and requirements than any other platform currently can, and as long as Google doesn't tighten their grip on it too much, it may remain that way... otherwise, Android will just be another pre-shaped hole in a childrens' toy to figure out how to fit the wrong pegs through... If Google had to give up the open-source portion of Android, and control it much more strictly as many here have said they would like to see, then Android would lose its primary distinction from iOS, and would lose the ability to compete properly... in a choice between two walled-garden ecosystems, I fear that it will be the best overall performer who wins, and in the short-term that would likely end up being iOS. It could still be argued that Android would make itself into a different "shaped-hole" than iOS, but iOS is already optimized to be a good fit for the majority of people ("pegs") who have already looked for a closed-system approach. After all, this is why BlackBerry is already on its way out... it is a walled-garden system being outperformed by a newer, flashier, more universally acceptable walled-garden system in iOS. What many people here are trying to pass off as "fragmentation" is actually Android's best property... iOS may be the clear winner in terms of stability, uniformity, consistency, and smoothness, but as long as Android continues on the path that it is on now, it will remain the clear winner in terms of customizability and near-universal acceptability. Out-of-the-box, iOS is what Apple makes it to be, but Android is whatever you can make it to be once you get it out of the box. ive seen plenty of app crashes on friend's iphones. dont pretend that its immune to simple programing errors. Being immediately availible for download, and being on every device are 2 different things. When iOS is updated, it has to wait for every last user to hear about the update, and then go do it.. for every update. then you have all the minor updates in between. Thus you have users running every version of iOS all over the boards, at any time, since most dont pay attention to updates. When google releases an update, it may take more time for a manufacturer to suite it to their needs, then pass carrier inspection, but when its released, its auto downloaded on thousands/millions of phones and the update is done.. without the individual needing to do or know anything. Thus android gets updated FASTER on the long haul. When the HTC Amaze has an update availibe, every HTC Amaze gets it immediately (not counting staggered roll outs which only increase it by a few days). When the i4 has an update, the user must first find out about it, then go find his computer with itunes, and download it and be proactive. I would just like to simply point out that iOS devices with 5+ can receive OTA updates. I believe that many people must've updated their iPhone 4 by now and iPhone 4s are already updated. if an app is not compatible with your android version or phone, it doesnt even show up in the marketplace. try again. Yes, iOS5 has OTA updates. Considering only i4s gets full iOS5, and every other version of the iphone that IS ALLOWED to have iOS5, only gets a partial OS update, then only i4s's have the full iOS5.. which in itself is REAL fragmentation. And no, I bet its still less than 35-40% of all iOS users have iOS5, because unless they bought a new i4s, they had to know about the update and then go about downloading it themselves. And yes, the "rant" is still completely viable because not every iphone has iOS5, now does it.. so the problem is nowhere near solved. I swear, you ifanatics think just because apple released it, the whole ecosystem magically updates at once. It doesnt.. never has and it wont for a long long time to come. Apple is still selling tons of 3GS and i4 models because of how cheap they are. So until all iphone models get full iOS5, fragmentation is going to get WORSE not better. And if your going to call one or the other fragmentation, i would say that sending out full updates to 1 device and partial updates to another is real fragmentation, since no matter what, you will NEVER have the full OS. Android may have devices on different versions, but when they get the update, they get the full thing, not some half baked update just to say they got it, like iOS does. This definitely is not true. My samsung captivate needs to connect to kies in order to get 2.3. Which is complete b.s. because I can not get the right version of kies because my personal computer is a mac book pro. So basically I am stuck at 2.2 because I use a mac. So your argument that all android devices get updated automatically once it is released is simply not true either. Everything is better on iOS. I believe you wrote this based on your reply to cellphonator on the jelly bean article. Am I right? @ Michael Honestly, the biggest factor for fragmentation in the Android platform stems from Android's strategy of being open source. Allowing multiple manufacturers to customize the OS to their specific hardware often creates incompatibilities between different devices of the same platform. I'm not saying that this is a bad strategy, but that this is the strategy chosen by Google/Android and therefore a significant portion of the blame lies with them. I would put less blame on the developers who have to use their often limited resources to reach as many people as possible. Developing for just one Android version would be an ideal situation for a developer, but that is not the case. He would have to develop for multiple iterations of Android to reach the entire Android base, and that may be less efficient of a strategy than to just develop for the most popular version of Android and then develop for other platforms. I think one would be headed in the wrong direction to argue that any developer would voluntarily introduce code that eliminate a portion of his/her potential user base. If anything, they would only be doing so because they had to do it to make the app work on the version of the OS they were prioritizing. yeah, Hulu has really been slacking off. look at Netflix. you can get it on any Android device. the Hulu devs really have no excuse for this. I think the lack of updates or major delays is not entirely a fragmentation problem. While it is true that the manufacturers place their own bloatware on their phones and tablets, the reason why we don't get updates is a combination of poor support from android phone manufacturers, and their desire to make their phones unique (the fragmentation part). This would not be a big deal if they would allow us to install the latest version for android when it comes out - unless its a Nexus they don't. Even worse are the manufacturers that lock the bootloaders so we cannot install our own ROMs (I'm talking about you Motorola). I have the worst example, a Droid DX2. Motorola loaded its crap motoblur on it - fragmentation. Then decided it would never provide the ICS update even though the phoe is less than a year old (poor support + fragmentation) and locked the bootloader (just plain poor) The end result is that we pay iPhone prices for phones that are poorly supported and so locked down we cannot even update them. "Open" android is a myth. That's why I switched to an iPhone. In many ways its more open then my DX2 will ever be. Especially if you consider it can e jailbroken. 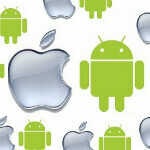 Every one who dislikes android because of fragmentation or has an apple product should read this article. That shows them right heh. 'There isn't one singular iOS device. In fact, there are now 3 different iPads, 4 different versions of iPod Touch, 5 different iPhones, and 3 versions of Apple TV, which run a modified version of iOS. For clarity, we'll just be counting the mobile devices, which means 12 total variants of iPad, iPhone and iPod Touch. This means the iOS ecosystem is filled with multiple screen resolutions, screen sizes and internal hardware. And, the ecosystem is also filled with multiple software versions.'.... And, they all run on iFragmented WiFi !!! @ Michael H: Very well written. Thanks. Michael you can barely contain your fanboyism you really belong in the comments and not writing articles.